Collecting scorecards from your rounds allows you to calculate your handicap. The golf handicap system was developed as a method of measuring the talent level of golfers, using scores in multiple rounds weighted against the relative difficulty of the courses being played. Using handicaps, golfers can compete against players of differing skills and abilities. Players can use a course's stroke index to determine if and when they are awarded strokes on holes during a competition. 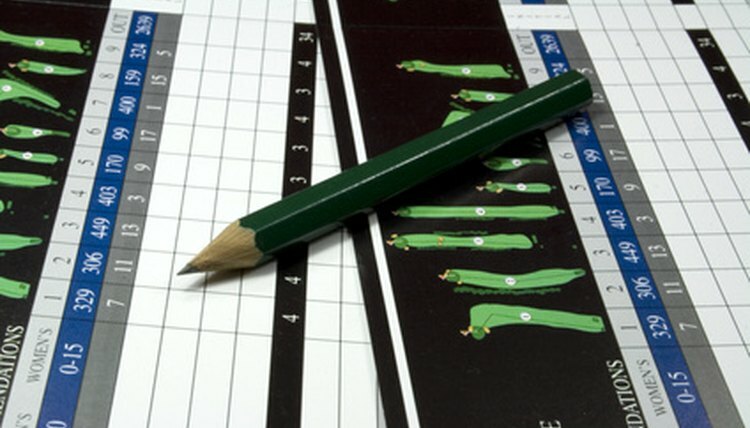 There are two important terms on a golf scorecard that must be understood to calculate the handicap of a player for a particular round of golf. The first is the slope of the course, and the second is the course rating, with each corresponding to a specific golf skill level. The course rating is the expected score of a scratch golfer playing a round of golf on a course. The slope rating is the expected score of a bogey golfer relative to the course rating, with 113 serving as the standard slope rating. To find his handicap for a round, a golfer locates on the scorecard the slope and course rating for the tees from which he played. The course rating is subtracted from the player's score, which is then divided by 113 and multiplied by the slope for the tees played. The resulting number is the handicap for that round. To find a player's overall USGA handicap, at least five scores are used, with a maximum of the 20 most recent rounds factored in. The average value of a set number of those scores is found to identify the player's overall handicap. When 20 scores are used, the 10 best are counted. If 19 rounds have been played, nine rounds are used. Every two fewer cards the player has a score for, one fewer is used in the average, down to only the best score for a golfer with either five or six rounds. The stroke index is a method of ranking the holes on each nine of a golf course from hardest to easiest. The front nine holes are assigned odd numbers from 1 to 17, while the back nine holes are assigned even numbers from 2 to 18, with a lower number signifying a more difficult hole. No number is repeated, meaning each nine is ranked from easiest to most challenging. When assigning handicap strokes for a round, the players simply must remove the difference in handicap from the score of the player with the higher handicap. During match play or skins, where scores on each hole are used, the stroke index comes into play. If, for example, a player is receiving seven strokes from her opponent, she would only receive a stroke off her score on holes with a stroke index of seven or lower. Handicaps over 18 can be scored similarly, with an example disparity of 23 solved by awarding one stroke on holes ranked 6 through 18, and two strokes awarded on the five most difficult holes.